We're all gonna die down here. . . . Trapped underground with someone—or something—out to get them, Casey can’t help but listen to her friend’s terrified refrain: “We’re all gonna die down here. . . .” in this bone-chilling sophmore novel by the acclaimed author of The Merciless. I still need to read The Merciless but I can't wait! Think I'll save all my "creepy" reads for October and have me a nice scary read-a-thon all month long! In Book 2 of the Immortal Game trilogy, Edie must learn the rules of the game . . . and then play better than anyone else. Through a Faustian bargain, Edie Kramer has been pulled into the dangerous world of the Immortal Game, where belief makes your nightmares real. Hungry for sport, fears-made-flesh are always raising the stakes. To them, human lives are less than nothing, just pieces on a board. Because of her boyfriend Kian's sacrifice, she's operating under the mysterious Harbinger's aegis, but his patronage could prove as fatal as the opposition. Raw from deepest loss, she's terrified over the deal Kian made for her. Though her very public enemies keep sending foot soldiers--mercenary monsters committed to her destruction--she's not the one playing under a doom clock. Kian has six months...unless Edie can save him. And this is a game she can't bear to lose. Loved Mortal Danger!! It ended with such a cliffhanger and I am DYING to read this one!! Yes! I am super curious for both of these. I haven't read The Merciless either, but both books sound insanely creepy. I think I may hold off and read them in October as well! I'm super excited to read Public Enemies as well. :) Great picks, Jessica! Both of these books read like they will give me nightmares! Nice picks- hope you love them. Oh, that first one sure sounds scary. Probably not for me. Hope you enjoy it though. I don't know either of these. Hope you enjoy them! Survive the Night does sound creepy - great pick. I'm not sure about the first one, but I have Public Enemies! I hope you enjoy these books when you read them, Jessica! Oh this book sounds frightening. That cover definitely ups its creep factor too. Great Choice! I haven't heard of either of these before and I'm not sure if they're for me but they both definitely sound kind of good :) Thanks for sharing and stopping by! Survive the Night sounds awesome! I like to save my creepy reads for October, too. I still need to read Mortal Danger, I hope I can fit it in soon. At least I won't have to wait for Public Enemies! Great picks! Both are new to me but sounds intriguing-- hope you get a chance to read it soon. Both are new to me but sound really good! I hope you enjoy them! I must say, the first one has a cool cover and a great opening line! Seriously, that 'We're all gonna die down here. . . .' got me quite intrigued. Both of these series are new to me. I hope you enjoy reading both of your picks this week! Thanks for stopping by My WoW. Both of these are new to me this week, but I love the cover of the first one. Great picks, I hope you'll enjoy them! Survive the Night sounds awesome! Thanks for sharing! They sure sound good but they're not my kind of books. thanks for sharing! Survive the Night makes me feel slightly uncomfortable, and I like it! Survive the Night looks scary and awesome! Hope you enjoy it! You NEED to read The Merciless, Jessica! It's such a creepy read! I can't wait for Survive the Night either. I'm sure it'll be just as great. P.s. I definitely think you should save the creepy reads for October. It will be worth your while! Great picks! This is the first that I've heard of both of these but they both sound excellent. Not really a creepy read kinda person. Well mostly. Hope you enjoy. Ann Aguirre has become one of my favorite authors! Will definitely be checking out Mortal Danger :) Thanks for stopping by my blog today. OMG! Survive the Night sounds AMAZING! Adding it to Goodreads right now! Both are great choices! 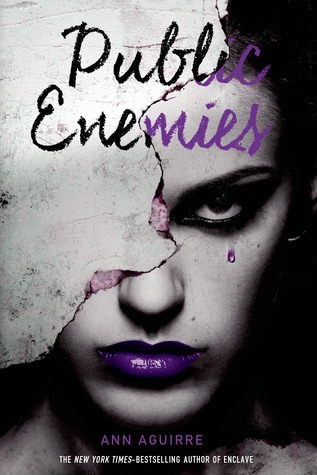 Love the cover for Public Enemies! 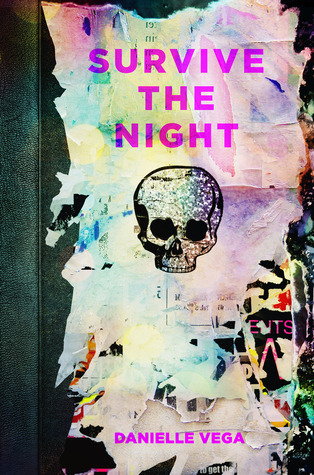 Survive the Night sounds very, very creepy, Jessica! And it really calls out to me :) Thanks for sharing! These are both new to me, I hope you enjoy them Jessica!